Broad spectrum of medicines are suggested for this ailment. Hematuria is divided into two types. Gross hematuria: When there is the presence of frank blood in the urine, it can be seen with the naked eye. This is called as gross hematuria. Microscopic hematuria: This kind of hematuria is characterized by the presence of RBC (red blood cells) in the urine. But RBCs are seen only when the urine is examined under the microscope. The color of the urine does not change and the patient cannot see blood to the naked eye. Most of the time there are no symptoms of hematuria in the patient. It is painless. But, when the patient passes blood clots in the urine, the patient of hematuria may complain of pain. The most common causes of hematuria include an infection of the urinary tract (UTI), vigorous exercises, menstruation in females and trauma. The other important causes of hematuria include the followings. Presence of calculus (stone) in the kidney, ureter or bladder When the stone passes down, it can cause hematuria. Taking medicines like Aspirin, NSAIDs (Non-steroidal Anti-inflammatory Drugs), and blood thinners like heparin and drugs like cyclophosphamide can cause hematuria. Cancer of kidney or bladder. Any person of any age including children and teenagers can suffer from hematuria in their lifetime. Following are the common risk factors for developing hematuria. When the patient has a family history of kidney diseases. Ingestion of medicines like Aspirin, heparin and other pain-relieving medicines of NSAIDs group. History of having enlarged prostate in the patient. Recent bacterial or viral infection. People who do strenuous exercises like running continuously for a long distance. History of presence of renal stones. Most common and useful test for diagnosing hematuria is the urine analysis test. Urine analysis test is done by doing a microscopic examination of urine. 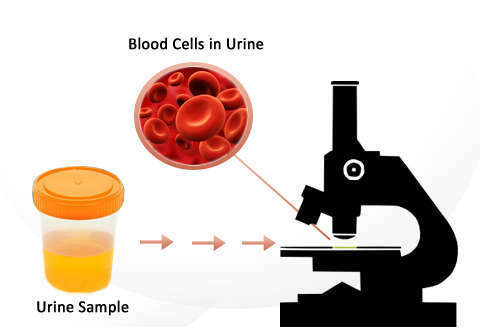 If the sample shows the presence of more than 5 RBCs in two consecutive urine samples, given on two different days, then it confirms the diagnosis of hematuria and the case should be investigated further. USG, CT scan, and MRI scan: Patient is subjected to USG or ultrasonography of kidney, ureter, and bladder. This is the most convenient and useful test to find out the presence of any calculus or tumor in the KUB region. Sometimes, if sonography findings are doubtful then patients are advised to undergo CT scans or MRI scans to get a more clear idea of the causes of hematuria. Cystoscopy: This is a procedure in which the doctor passes a thin, flexible; lighted tube through the urethra. The tube is further guided up to the bladder. By doing this test doctor can examine the inner walls of bladder and urethras. If there is any obstruction of urine due to small urethral stones or bladder stones then they can be removed by doing the cystoscopy. A urethral stricture can also be corrected by doing this test. Kidney biopsy: A small piece of kidney is removed from the body by using a needle. This piece of tissue is then examined under the microscope by an expert. This test is used to diagnose the type of kidney disease which causes hematuria. Blood tests: Simple blood tests like CBC, S. creatinine, BUN are advised to the patient. Management of hematuria: Hematuria is not a disease but a symptom of some underlying disease condition. So, management of hematuria involves resolving the underlying pathology responsible for the development of hematuria. This means, if the patient is found having urinary tract infection then he should be treated with appropriate antibiotics, if there is the presence of stone in bladder, kidney or urethra then appropriate measures for the stone removal should be taken. Dietary modifications: There is no particular diet change required for the patients suffering from hematuria. But, they can be advised to drink at least 10 to 12 glasses of water per day. This may help in flushing out small stones from the body. Homeopathic approach is based on treating the underlying cause of hematuria. In those cases where exact cause is not elicited, there are some broad-spectrum medicines suggested addressing the disease. Homeopathy is strongly suggested for hematuria.